May 15, 2017, 10:57 a.m. Although the party appears to be struggling nationally, there are some promising, if fragile, signs for incumbent Labour in MPs in the crucial marginal seats. But it might still not be enough. New YouGov data provides a deeper look at the views of voters in 50 seats that Labour won in 2015 that the Conservatives are targeting on June 8. These are the seats where Labour holds the smallest majorities and the outcome in them will play a major part in deciding the shape of the result next month. These seats are spread across England and Wales – from Bolton in the North to Brighton in the South East. 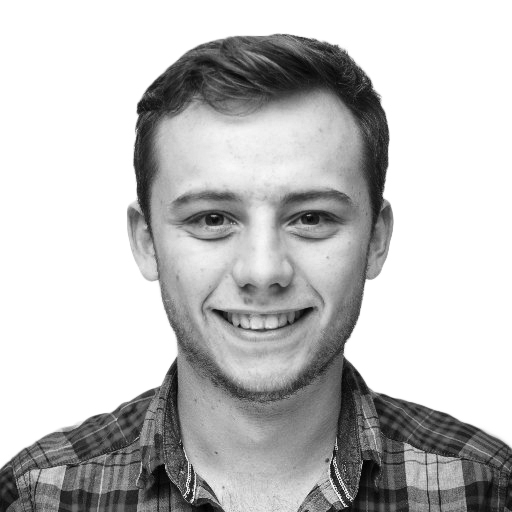 They range from the City of Chester, where Labour won with a 93 vote majority over the Conservatives in 2015, to Newport East, where it prevailed by a margin of 4,705 votes. In all but one seat (Copeland, where Labour recently lost a by-election) Labour goes into this general election holding the seat, and in most the incumbent Labour MP is standing again. Although this data doesn’t say anything about the seats individually, it does start to give us a picture of how this election campaign is shaping up in those places that arguably will matter the most. Here are the seven biggest findings from the research. Just like we have been seeing across the country, there has been a swing against Labour in the marginal seats they hold. Overall the Conservatives have increased their vote share by 11% since the last election, and is now polling at 47% across the 50 seats. Meanwhile Labour has dropped by 4%, from 42% to 38%. This would imply a swing against Labour of around 7.5%, compared to a national swing of 6.5%. If you were to apply this uniformly across all the seats polled it would mean Labour losing all of them, although there are limitations in applying a uniform model across such a wide range of diverse constituencies. 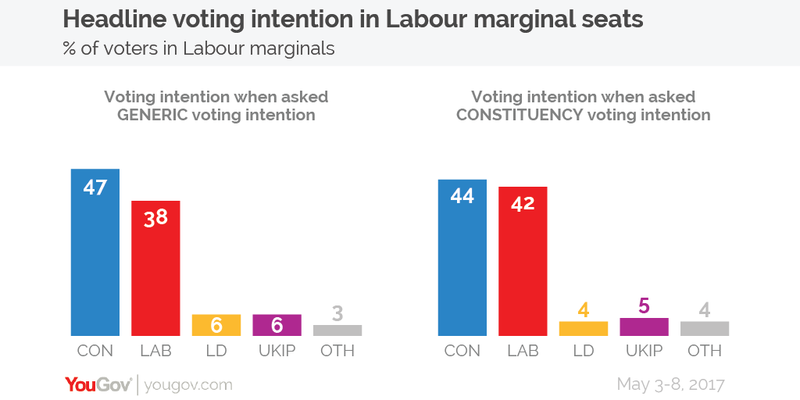 However, there are reasons to believe that a “national” voting intention question might not be picking up the full picture in these marginal seats. When we asked voters to “think specifically about [their] own constituency and the candidates who are likely to stand there” the Labour vote is unchanged on the 2015 election, although the Conservatives increase their vote share by 8%. This means the swing is reduced to 4%. 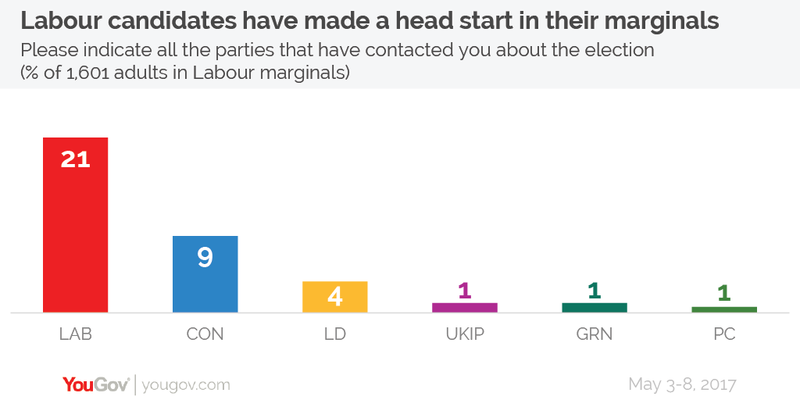 One thing that could explain some of the difference between the national and constituency figures is voter contact. In total, a quarter (26%) of people in these marginal constituencies have heard from at least one of the political parties during this campaign. However, while one in five voters (21%) voters recall being contacted by the Labour party, the figure is just 9% for the Conservatives. This isn’t completely surprising. In most of these places Labour have a “head start”, with incumbent MPs who should be speaking to constituents as part of their job. Most local Conservative associations have only recently selected candidates and have just started hitting the doorsteps, so these figures will probably change over the next few weeks. 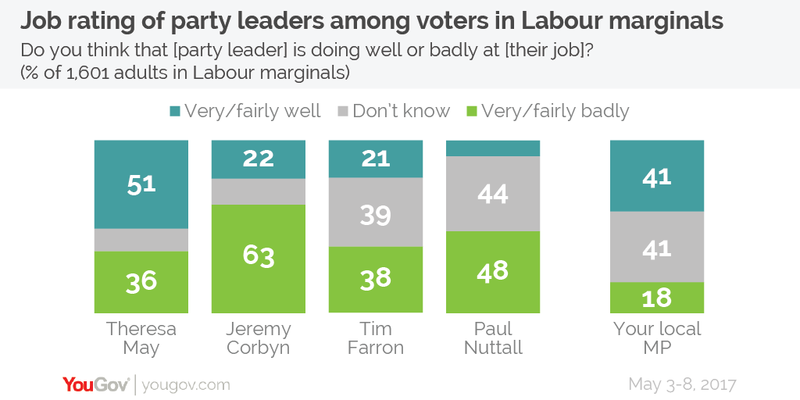 But what is more surprising is the way this interacts with the voting intention results previously mentioned. Amongst those that have heard from their Labour candidate, 53% say in the general voting intention question that they are planning to vote Labour – a lead of 19% over the Conservatives. And Labour gets an even bigger boost when it comes to the constituency question amongst those who have been contacted by their MP – with the party’s vote share increasing to 59% and their lead over the Tories increasing to 30%. However, this evidence isn’t enough on its own to say that being contacted by Labour is causing the dramatic vote shift – the correlation could be caused by a range of other factors e.g. people with a more positive opinion of their local Labour MP being more likely to recall being contacted by them. Another reason we could be getting some difference between the local and national question is tactical voting. There has been a lot of talk about a “progressive alliance” in the past few months, with the idea being that Labour, the Liberal Democrats and Greens effectively gang up in seats like these to try and stop a Conservative candidate from winning. We tried to measure levels of tactical voting by asking whether the party they intend to vote for was not their first choice, but stood a better chance of beating a party they like even less. Of the 25% of voters who tell us they are voting tactically nearly half (49%) say they will vote for Labour in their constituency, compared to 33% who say they are voting Conservative and 6% who are voting Lib Dem. 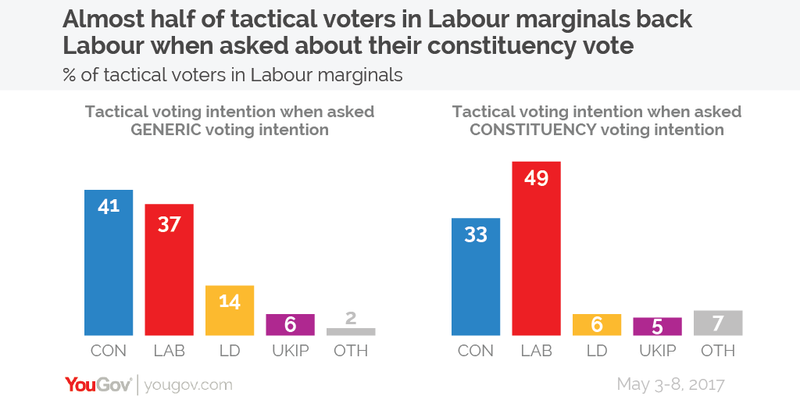 This isn’t the case when we ask the national question – where the Conservatives lead Labour amongst tactical voters – meaning that voters are only considering supporting a party to keep another one out when you specifically ask about it at a constituency level. When asking people in these marginal seats whether they could name their local MP, nearly half (46%) could do so correctly. Older voters did better, with 54% of over 65s knowing compared to just 31% of 18-24s. Counter to expectations, there doesn’t seem to be a relationship between length of service and the number of constituents who can name their MP. In those areas where the MP was elected in 2010 or later, 48% can name their MP. In their areas where the MP has been around for longer, 45% can name their MP. This implies that either newer MPs have done a better job at getting their name out there, or this is something that people either learn quickly or don’t learn at all. However, efforts on name recognition don’t always go to plan – there were two respondents in Peter Kyle’s constituency of Hove who incorrectly thought his first name was Jeremy. Over six in ten (62%) think that the Conservatives will win a majority of some kind. A fifth (22%) think they will win a landslide, three in ten (31%) believe they will win a moderate majority and around one in ten (9%) reckon they will win a small majority. 7. Can Labour candidates save themselves locally? One common theme running through all these results from marginal constituencies is that the picture looks slightly better for Labour locally than it does nationally. 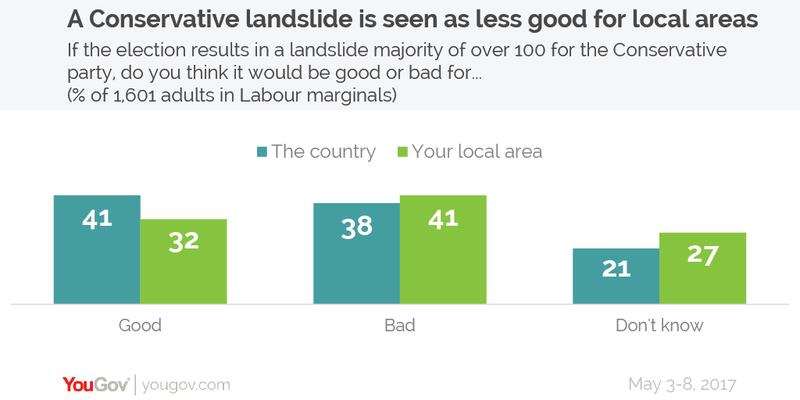 Labour gets a boost in voting intention when you ask people to think about their own constituencies, the party has contacted more voters, incumbent candidates are seen as doing a good job and a Tory landslide is seen as being bad for their local area. If voters enter the polling station thinking about local issues some Labour MPs might stand a fighting chance of holding their seats despite the strong headwinds. But before Labour candidates breathe a sigh of relief, many of these arguments were being made in 2015 about the Liberal Democrats. Then, the Tory tide was too strong for many of them and few managed to hold on. If people enter the voting booth thinking about the national government and Theresa May, Labour MPs in these marginal constituencies could face the same fate.